Carrington Fox has a review of the new Melrose location of B&C BBQ in this week's Nashville Scene. You can read her review here. You can read our review of B&C's original Farmer's Market location here. We hope to make it to their new location soon. 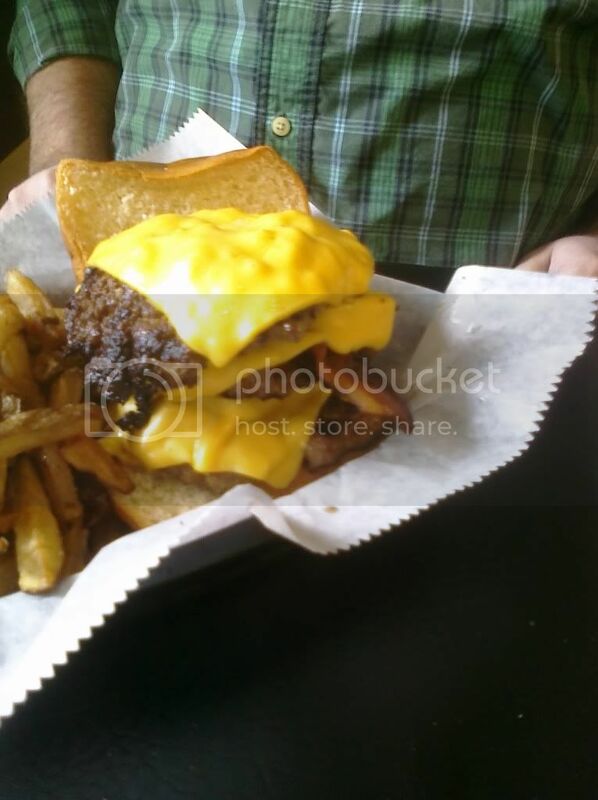 There have been several comments over at the Bites blog discussing a 64 restaurant burger tournament. So BP and I, being fans of the burger and college basketball, will be bringing you a bracket style Nashville Burger Tournament. The 64 finalist (we don't have a play in game) will be announced on Selection Sunday March 14th. Then the first and second round will be held March 17-21. The Regionals will be held March 25-28. The Final Four will be on April 1-3 and the Finals will be held April 3-4. 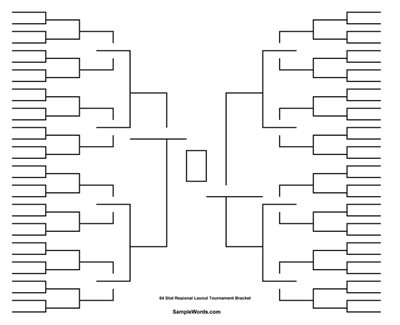 This will be a voting style tournament. So gear up and get ready to vote your favorite burger to victory. We have all of the obvious choices, but if you have a diamond in the rough with a strong RPI. Then leave us a comment and they will be considered. March is quickly approaching, and for Nashville diners this means two things. First the re-opening of Martin's BBQ and secondly the opening of the highly anticipated new burger place Burger-Up. We have been waiting for the re-opening of Martin's BBQ for quite sometime, and it looks like Tuesday March 2nd will be the day. This new location will feature an expanded dining area, bar, drive-thru, and most importantly a whole hog pit. To my knowledge Martin's will be the only place in Middle Tennessee cooking whole hog, and trust me you wont want to miss out on that middlin meat. With an expanded kitchen and staff, look for Pat Martin to offer up some new specials. To stay up to date on the happenings at Martin's, follow him on Twitter - @martinsbbq. For those omnivores closer to the city, Burger Up is coming to 12th South sometime in mid March. This is the brainchild of Frothy Monkey owner Miranda Whitcomb who looks to bring a local flair to the traditional burger. We don't know what exactly is in store for us burger lovers, but we do know that the meat will come from the Triple L Ranch in Franklin. Ummm... how's a Triple L Ranch triple burger with Benton's bacon sound? As soon as we have a chance to hit it up we will report back. Well, the name of this one is just a hanging curveball over the inside of the plate, isn't it? Go ahead and do with it what you will; I'll move on to the review. I can't seem to find any information or background on this product, other than that it's manufactured by Palmetto Canning Company in Florida. The color of the sauce is kind of a faded rusty reddish brown. It's got a fairly thick consistency and a smooth texture. The aroma is strong of vinegar and peppers. In terms of taste, this sauce is definitely less sweet than most that you will find at a grocery store. It's heavy on the vinegar tang, with a lot of mysterious flavors swirling beneath. And it's got a pretty serious peppery finish. There is some sweetness, but it definitely plays second fiddle to the other flavors in this sauce. This is not on the menu, but just ask for it and Doug will whip you up a triple. Check out the latest thing to hit the NYC pizza scene, it's the pizzacone. Is it a good idea or just a gimmick destined for failure? NASHVILLE BARBECUE: Part 19 - "Barbecue by any other name..."
Greg Johnson and Vince Staten's excellent book, Real Barbecue, begins with an interesting discussion of what real barbecue is and how to go about finding it. There are the classic criteria of a smokey aroma around the place and of a mix of pickup trucks and luxury cars in the parking lot. But they also offer the suggestion that 'real barbecue' joints should not specialize in anything other than barbecue. I decided to put this to the test in Nashville, where there are several restaurants that, while not 'barbecue joints' per se, still have a reputation for serving great barbecue. First up is Calhoun's, and their self-proclaimed "Best Ribs in America." Well, they did win first place at Berea's National Rib Cook-Off in 1984. This is a small scale chain that was started in Knoxville in 1983. They now have eight locations - six in East Tennessee and two in the Nashville area. I went to the one on White Bridge Road. The restaurant is gargantuan - two stories, with a huge bar downstairs. I can imagine that back in the heyday of Lion's Head Village, this place was absolutely booming. My buddies and I went pretty frequently in high school for all-you-can-eat ribs on Thursday nights. But these days, business seems pretty slow. Although the ribs are clearly their signature item, you can also find: spinach and artichoke dip, chicken cordon bleu, and an oriental chicken salad, among other things. I'll tell you what - I don't know about best in America, but these ribs are not bad at all. They're baby backs, but they have a good amount of meat on them. And they're cooked to a perfect tenderness. Flavor-wise, there is some room for improvement. Despite the fact that they're 'hickory smoked,' there is little to no smoke flavor on the ribs. Calhoun's house barbecue sauce, while not outstanding, complements the pork flavor well. It is a thinner sauce than I would have expected, and not as sweet. Overall, a good but not great rib for a restaurant. The pulled pork was good as well. It was super tender and juicy, and was very well seasoned (if a bit salty). And although there was a baby little smoke ring visible on the bark pieces, there was again no discernible smoke flavor. Next up, the Crow's Nest in Green Hills. This is a relatively new restaurant that took over the space long inhabited by the Box Seat. They have certainly spruced the place up, because in its later days, the Box Seat was an absolute dump. And the Crow's Nest is still a sports bar...kind of - their menu says, "Sometimes a Sports Bar, Always a Restaurant." The crew that owns this place obviously have a proclivity for barbecue. Among other places, they own the local chain of Corner Pub restaurants, whose "Smokin' Monday" promotions have been very popular. Also, they entered the Music City BBQ Festival last year under the Crow's Nest name. However, barbecue is far from the sole focus at the Crow's Nest. In fact, they describe their cuisine as "Gulf Coast Southern Comfort." In addition to barbecue, you can find: oysters on the half shell, shrimp & grits, jambalaya, and fettuccine alfredo. First, let's address the elephant in the room. Yes, they did garnish the pulled pork sandwich with tomato and onion. This is pretty much inexcusable. I mean, *Whitt's* thinks that's excessive. The bad news is: the pulled pork is not very good. It tasted bland and completely unseasoned. The good news is: the barbecue sauce is amazing. They do make it in house and I am here to say that this is one of the best barbecue sauces I have tasted in a restaurant. It cures all manners of ills, and that pulled pork sandwich is ill (not the good ill). The ribs were moderately better. They were cooked to a nice tenderness - not falling off of the bone, but still very tender. They seemed to have been finished over direct heat, which yielded some nice charring. And while they were seasoned better than the pork, they were still a bit lacking in the flavor department. It was nothing that the sauce couldn't fix, but the rib unadorned was definitely a disappointment. Our final stop in this report is decidedly more blue collar. Tom's Elite Carryout is in East Nashville on Gallatin Road. It's neat that they used the word elite, because before this was a restaurant, it was Elite Motorcars, a used car lot that has since moved to another location. And despite the fact that carryout is in the name, there are several tables inside if you want to eat there. In addition to barbecue, you will find: meat&3, steaks and burgers. Reuben's Rockin' Ribs are served sans sauce, but with a savory rub, which gives the ribs fantastic flavor. Sauce is served on the side, but is not necessary. Contrary to the two other places visited in this report, these ribs have plenty of smoke flavor. My one complaint is that these ribs overshot the runway a bit on tenderness. I'm not sure if they were cooked that way, or if they just sat too long in the warmer, but they were absolutely falling apart with tenderness. The shoulder sandwich also had great flavor - again, just enough smoke and very well seasoned. Again, the tenderness was a bit off. The pork was relatively dry, suggesting that it had either been cooked too long or had sat too long waiting to be served. Overall, though, this is about as solid an option as there is on the east side. The Nashville City Paper is reporting that William Sullivan (pictured above) allegedly stabbed his buddy in the parking lot of Mickey Roos in Franklin last night, amongst a crowd of people (Friends Like These, huh Gary?). The unnamed victim was treated and relaeased from the hospital. I'm not really sure what was meant by the "taste of Texas" crack in the article, but our review of Texas-style barbecue in the Nashville area, including Mickey Roos, can be found here. How do you get your jolt? 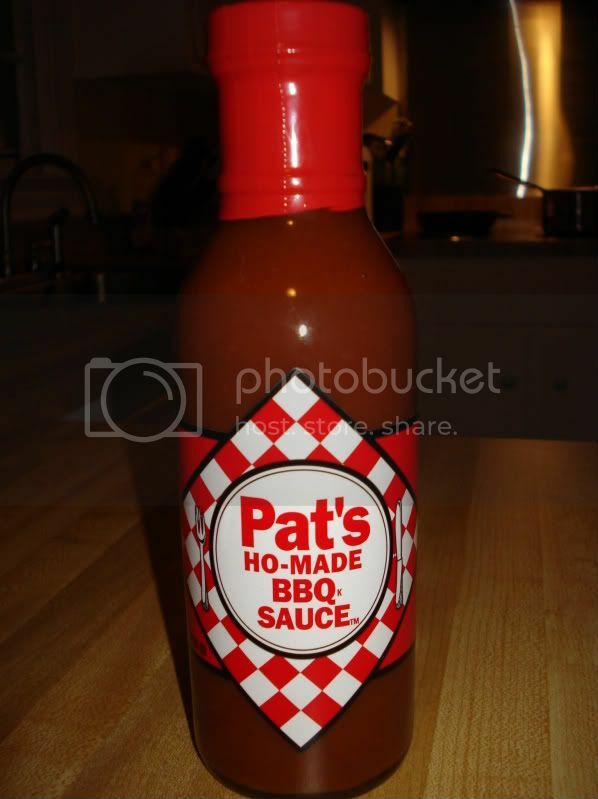 It's another barbecue sauce from a famous barbecue restaurant, but this one is from...Cincinnati? Yep, it's Montgomery Inn, self-proclaimed "Home of the World's Greatest Ribs." I will admit up front that I have never eaten at the restaurant (I'm usually too busy loading up on chili or goetta when I'm in the 'Nati), but I have definitely heard of it. The place was opened nearly 60 years ago by "The Ribs King" Ted Gregory in Montgomery, Ohio. They have since added locations in Cincinnati proper and in Northern Kentucky, as well as a location in Dublin, Ohio (hometown of one Lucas J Schneider). The place's notoriety has swelled to the extent that "every president from Gerald R. Ford to Barack Obama has enjoyed [Montgomery Inn's] ribs." Yes, it's that kind of place. And like so many of that kind of place (many of them located approximately 3 hours to the west of us), they now operate a hefty mail order business, shipping frozen slabs of ribs to all corners of the globe (for $23 a slab, plus shipping). And they sell their barbecue sauce in grocery stores. 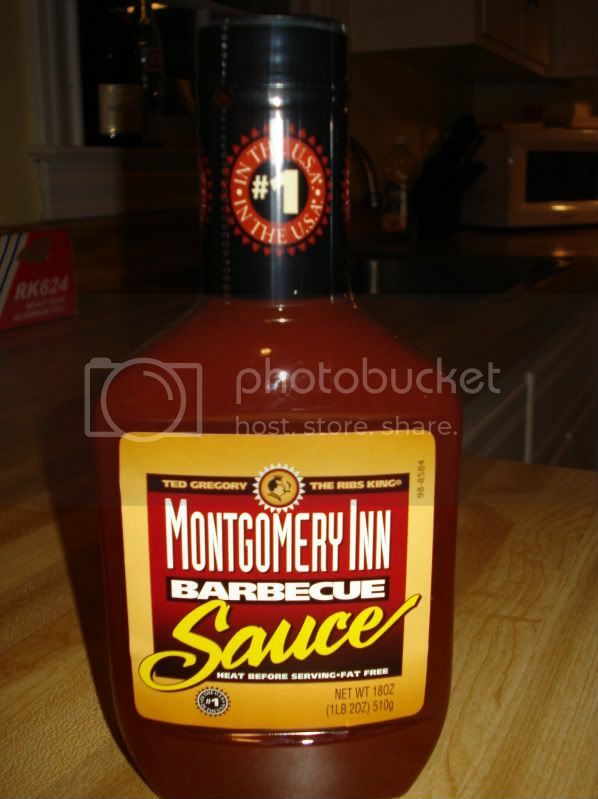 Montgomery Inn is the only "restaurant" barbecue sauce available in Middle Tennessee that this not from a Memphis-based restaurant. The sauce itself is about as basic and unadventurous as its label. It falls into the category of "spruced up ketchup." It's a little bit thinner than ketchup, but with the same smooth consistency. Its flavor is very tomato-centric, but sweeter and tangier than straight up ketchup. The sweetness does not have much personality, and quite frankly, neither does the sauce as a whole. Right now the cost will be around $15, but the more we order the price will go down.